Ok, some news: I am a drinkmongerer (this is a good thing). I now work part-time for Drinkmonger, the wine arm of Royal Mile Whiskies. Currently, there are 2 Drinkmonger’s in Scotland. One in Edinburgh and one in Pitlochry. They both have an excellent Wine selection, beer selection and an interesting Whisky selection (as you can imagine, being part of RMW). We have only been open just over a month. The selection and range is ever expanding and we are starting to do tastings, which is exciting! 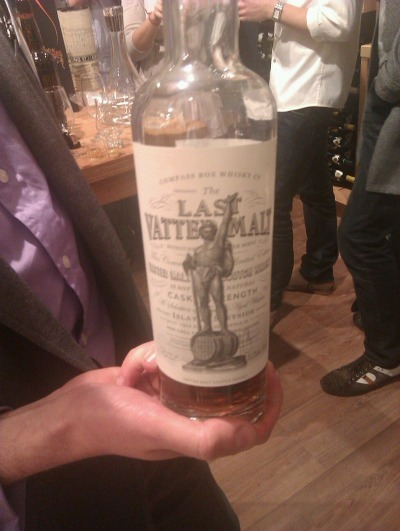 Compass Box were our first tasting as a new shop. They brought along many different bottlings including Orangerie, Spice Tree and Peat Monster. I was having a wee dram of Orangerie (perfect for a cold night) when Chris Maybin of Compass Box happened to mention he had some little exclusives for us to try…. A vatting of 35 year old Speyside and 26 year old Islay whisky. Nose: Honey BBQ smoke. Creamy Apples and Pears, limes and spice. Kind of like a glazed honey ham. Mmmm glazed honey ham. Palate: Burnt Toast, honey, vanilla, maltiness and a dry smoke. Overall: Yup, it’s nice. Tasty and with many levels. It’s not a huge hittter, but I enjoyed it. A combination of grain whiskies from Invergordon, Carsebridge, Port Dundas and Cameron Bridge. Palate: Right up my street. Grapefruit, purple fruit pastels. It’s the type of whisky I like. Ribena style. Overall: It’s got that Aged Grain Whisky lovliness that is similar to the beautiful flavours you get from irish whisky giants Jameson 18 & Redbreast 12. What do I think? Well, if you have the money, I would say buy them, buy them now. They are both tasty and collectable. But…. I still enjoy Illegal Spice tree and Hedonism the most. In my humble opinion, those are very hard acts to follow. This entry was posted	on Friday, November 25th, 2011 at 9:24 am	and is filed under News. You can follow any responses to this entry through the RSS 2.0 feed. Responses are currently closed, but you can trackback from your own site.